So, its been about 20 years since the iconic Channelwood Age poster was originally printed, and the things have become exceedingly rare. Nothing but expired ebay listings await you if you're looking to buy one these days. He managed to get one of the last remaining posters from Cyan Worlds themselves. I seriously respect the effort this guy put in, and major props to Cyan for digging one up. I don't know of many developers that would have done something that awesome for a fan. But after reading his post, it became pretty clear that the chances of getting a genuine poster myself were slim-to-none. Thankfully, Blake took some seriously high-resolution photos of his poster. None of them are a perfectly clear shot (over-exposed, flare, reflections off glass), but it gave me an idea... I wondered if I could reproduce a reasonable copy myself? I gathered up every photo I could of the poster. Google, Flicker, DeviantArt, you name it. I spent two days aligning and correcting all of the various photos, removing lense distortion and adjusting for all the varying perspectives. Once they were all in-order I composited the images together, manually painting-in the best and least-distorted parts of each one. This gave me the best possible version of the actual Channelwood artwork I've ever seen. With the artwork restored, I cropped it out and went about reconstructing the rest of the poster from scratch at print-resolution (300 DPI). The artwork was placed on a 24x34 black matte and positioned appropriately to match the original poster. Then it came to reproducing the text... which turned out to be almost as difficult as getting the artwork into a usable state. 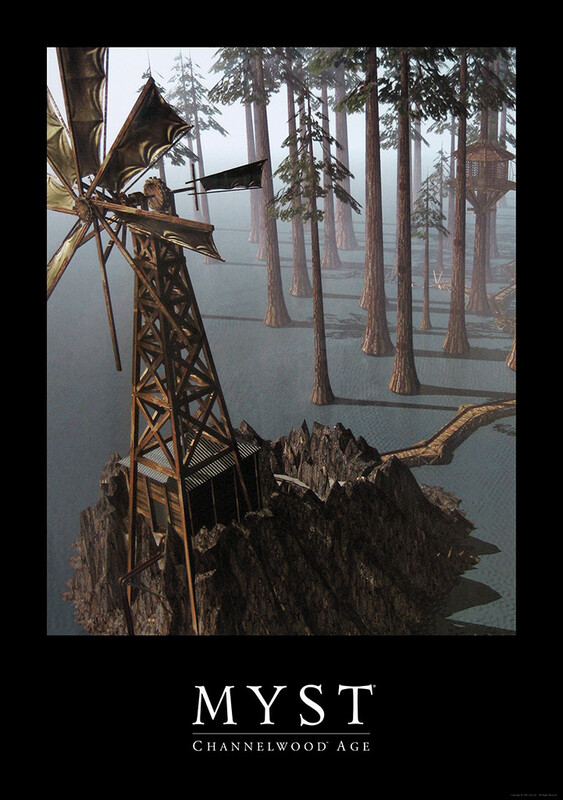 The "MYST" logo on this particular poster doesn't match most other examples, and no premade fonts matched perfectly either. Adobe Garamond Pro is very, very close, though. I pulled the highest-quality photo of the logo I had into Illustrator and went to work. Typed out the text in Adobe Garamond Pro, converted the text into paths, and then tweaked every character by-hand to match the text on the poster. Once finished I rendered the text out at 300 DP and pulled the resultant image back into Photoshop for final positioning. Not a single detail was missed, even the copyright and trademark symbols are present (The copyright information in the bottom-right corner even matches the original poster). Disclaimer: As a precaution, the above has been scaled down to only 721x1024 so as to make it absolutely unusable for print. This project is for personal use only, I do not mean to distribute the full-resolution source or any resulting prints. If the mods wish, I can water-mark the above image as well. Thanks guys, I'll post up some additional pics when I get it into a frame (should be here in a few days). 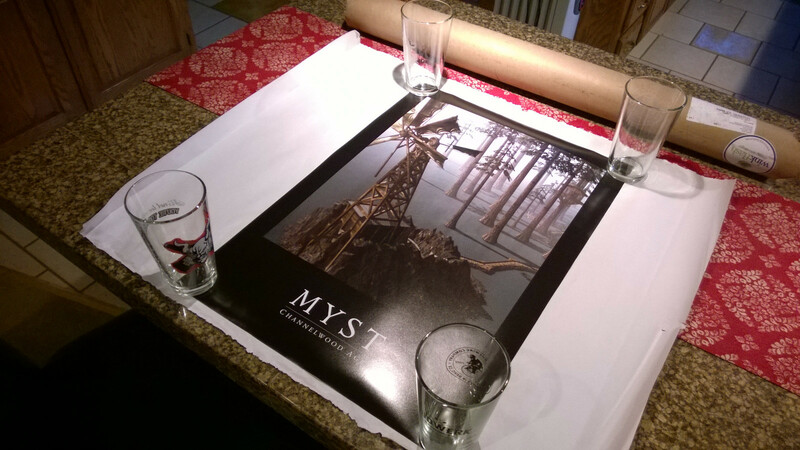 Should look great next to all my Myst game boxes. hehe. I'd be curious to know what Cyan thinks of this. I'd love to release the source file for others to re-print, but not without permission from Cyan Worlds. Of course, I'd also love to see Cyan issue a new run of these posters. Another option might be to tie your poster in with the Obduction funding effort. Several other fans have added their own creativity as an incentive to donate, so I'm sure a *few* folks would be happy to pony up some cash for Cyan in order to get their hands on an exclusive Channelwood poster reproduction! 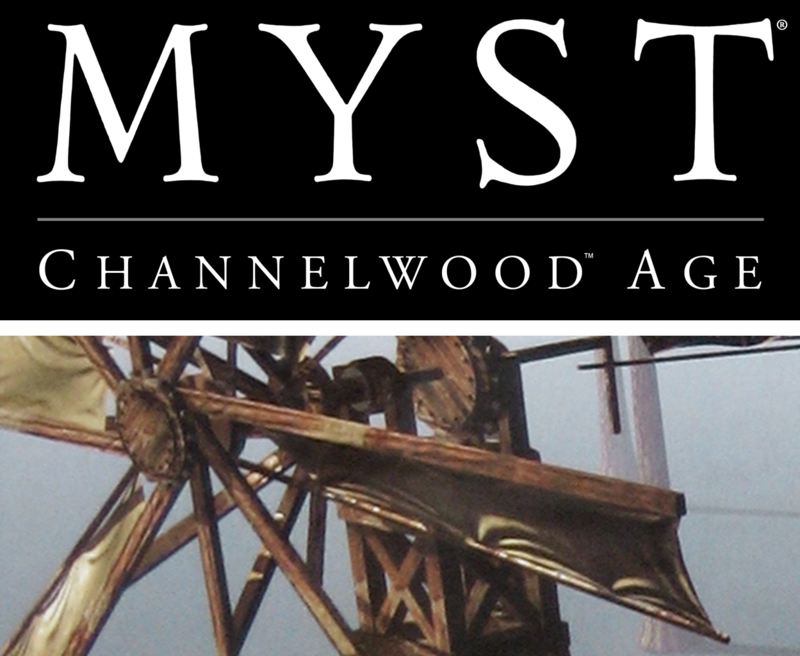 They have a high resolution render of the image used on the Channelwood poster. It has some weird depth artifacts going on in the transparent textures, so it doesn't appear to be the original render, but it's a LOT cleaner than the photos I was using. It also shows more to the right of the image than the poster does. I'm updating my poster with this new source, and it's already looking a lot better. Lots of little things need to be touched-up in the above image, but even so, this should be my best version yet. Cool, you found my site! Heh, yup. Stumbled onto it while searching for a good image of Stoneship. Any information on the source of that Channelwood render? It really is the best source I've seen so far, rendering errors and all. Nope. I found it on tumblr I think.